At Elm Terrace Gardens we value and welcome new volunteers who are interested in sharing their time and talents with us. By checking this box, I agree to accept the following responsibilities. 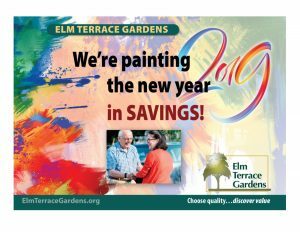 In applying to be a volunteer at Elm Terrace Gardens, I accept the following responsibilities: To participate in your volunteer training program; To become familiar with and follow all policies and procedures that apply to volunteers; To become familiar with and respect residents rights at all times; To fulfill the commitments I make as a volunteer, as fully as I am able. To keep all Elm Terrace Gardens information strictly confidential, and to discuss such information with staff and volunteers only as absolutely necessary. I understand any information not kept confidential will result in my immediate dismissal.